I mentioned the other day that new installations of onshore wind farms had dried up recently, following the ending of subsidies. It appears that something similar has happened to solar power. As with onshore wind, the Renewable Obligation system was closed to new capacity from April 2016, but with a grace period for installations up to March 2017. Moreover, the latest CfD auction this year excluded established technologies, such as onshore wind and solar. The previous auction was in 2015, and out of the five successful projects, two have been installed and the others cancelled. Effectively therefore, all subsidy mechanisms have now been withdrawn from solar projects. Latest government figures show that only 77 MW has been added in the last 6 months. The latest quarter is still provisional, and may rise slightly, but investment in new solar does appear to have seriously stalled. So much for solar being one of the cheapest sources of power around! Great to see common sense prevail for a change. The damage already done is almost beyond measure. Every household is paying twice what it should for electricity. How much of our manufacturing industry has been chased abroad due to energy costs? How long must we wait for the climate-change faux religion to die. The monumental folly of the Climate Change Act 2008 must be repealed before we can escape from this nonsense. People like Ed Davey ran with it with great joy and enthusiasm; it seemed to fit their distorted mental capacity. Is Drax power station destined for ever to the burning of wood pellets from the destruction of American forests.? Are our huge coal reserves destined to be imprisoned underground forever.? Are we to deny the bounty of oil and gas obtained from so-called fracking? Are we really so stupid? A minister has resigned for touching the knee of a reporter, JHB, in 2002, fifteen years ago. Ministers responsible for the Climate Change Act are still at large in the H o C despite the enormity of their crime. Let’s hope they are outed before 20230. We have roughly 12.5Gw of installed Solar according to that graph. Take a look at The UK National Grid data, on a good day it is peaking at around 5Gw, the rest of the time it is a lot less and of course absolutely zero for hours at a time. 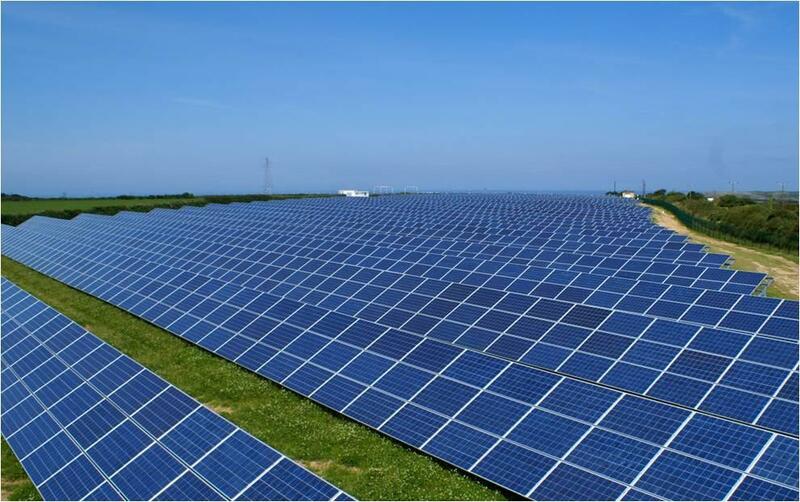 With an average capacity factor in the UK of about 10%, the energy generated during the lifetime of solar panels is less than the energy used to manufacture and install them. And then there is the problem of what to do with them when the solar panels reach the end of their useless lives. It will be the next generation’s problem. But then the government says it is sustainable development as it will not harm future generations. We are truly governed by idiots. Don’t tell me that the Sunny UK is gone, replaced by a Rainy UK. The decision taken by Ed Milliband as Energy Secy. to go ahead in 2010 with the FiT scheme for Solar PV at a subsidy cost of 42 pence per kWh, and allowing 1,100MWs to be installed before the price subsidy was cut, will cost GB almost as much as the decision by Gordon Brown to sell of our gold when the price was at a low. It is no wonder that the RegenSW annual progress report for renewable energy is 3 months late this year. They must be struggling to explain why such cheap technology is no longer being deployed and is no longer producing hundreds of thousands of green jobs. “annual progress” interesting choice of phrasing. hmm. if it (RegenSW annual progress report) was 300 hundred years late, what difference in the great scheme of things? The step changes in deployment in March each year reflect the rush to get schemes completed and commissioned by the end of the financial year, i.e. before the FiT subsidies are reduced. That step change alone is enough to demonstrate how completely solar power has depended on massive consumer subsidies. How dare you all impugn the selfless and virtuous providers of power from sunbeams – didn’t you know now that it’s subsidy free and fully competitive with deadly fossil and nuclear alternatives – you heretics! Some time back you mentioned that you preferred looking at http://www.variablepitch.co.uk for ofgem figures … I was wondering if you’d ever had the opportunity to close the loop between what’s reported there and other (subsidy seeker / power provider) sources. I’m hearing wildly bigger payments than are reported there ….. possibly BS – but would be good to corroborate what I’m seeing. These are Renewable Supporting figures. UK Solar produces at capacity factor of about 10%, mostly when you don’t want it. I’ve wondered, from time to time, if covering up the land with all those solar panels that intercept the solar energy – thus not allowing it to reach the ground – as to how much of a “cooling affect” does that have on the earth below them? If you prevent the earth from gaining, storing, and then later releasing that heat into the atmosphere, aren’t you modifying climate? Granted, it would “earth cooling” not earth warming, but still, isn’t impacting climate by our activities supposed to be what we are doing wrong now? Probably no great impact on a global scale, yet on local scales, I would think there would be some. ?More likely to raise temperature locally by absorbing high energy light and converting part of it to leccy and part of it to heat. Depends on the albedo before the panels, and how much light was formerly reflected back into space.